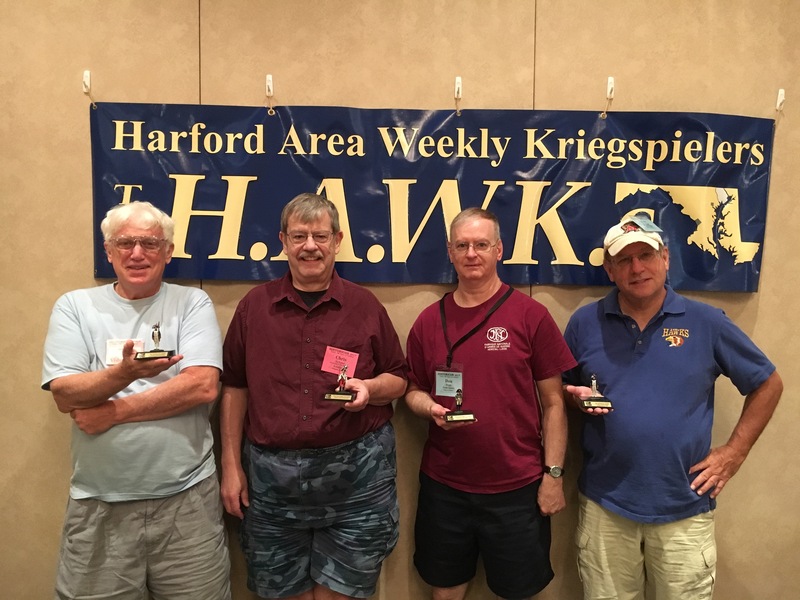 July | 2017 | H.A.W.K.S. 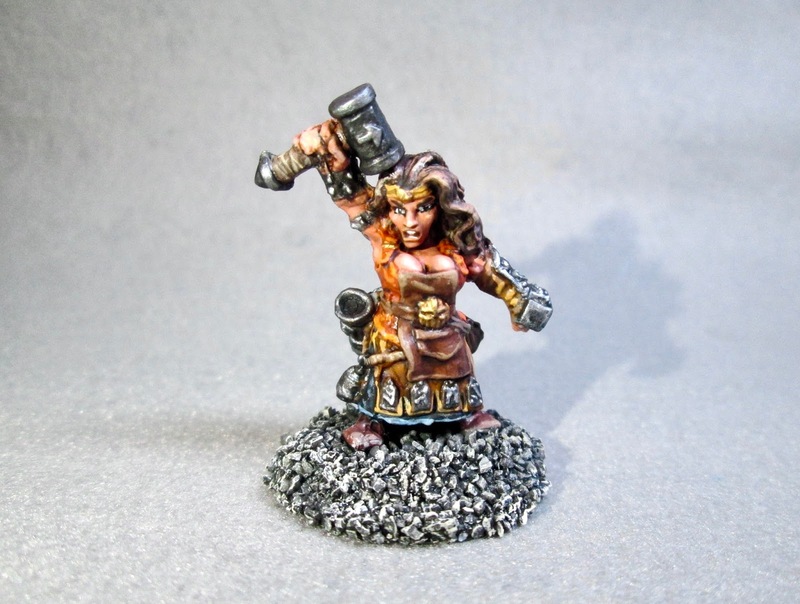 This past week I painted the Margara, Dwarf Shaman, figure from the Bones 3 Original Core Set. 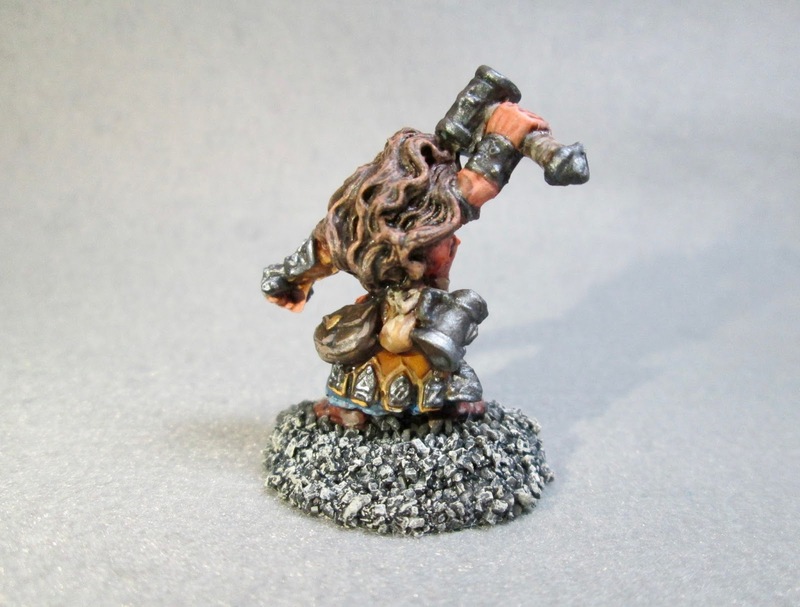 Instead of painting her as a magic user I decided to use her just as a plain old fighter, since I needed another Thug figures for my Dwarf-themed warband for Frostgrave. I began by giving the figure a wash with heavily thinned Reaper “Grey Liner” using a wet brush. 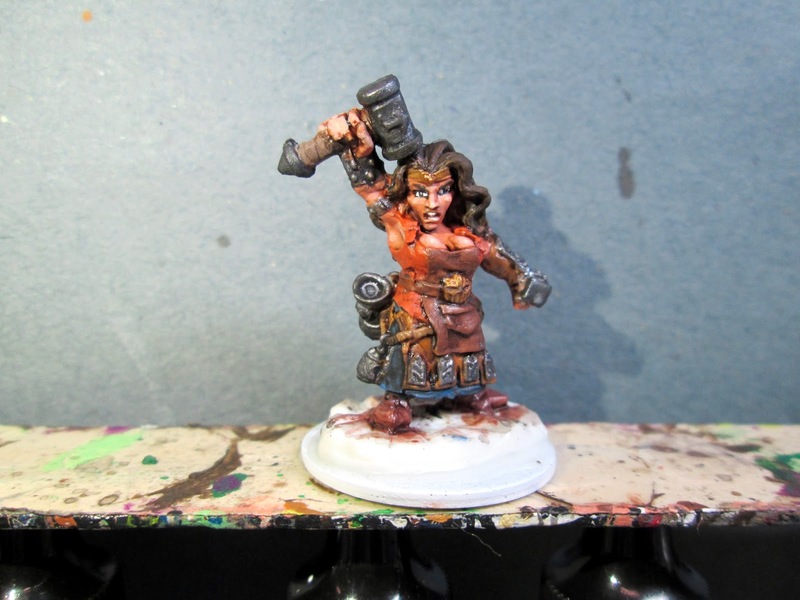 When that was dry, I painted her skin with Citadel “Dwarf Flesh”. I then painted her skirt with Ceramcoat “Denim Blue”, and her shirt with Crafter’s Acrylic “Orange Spice”. 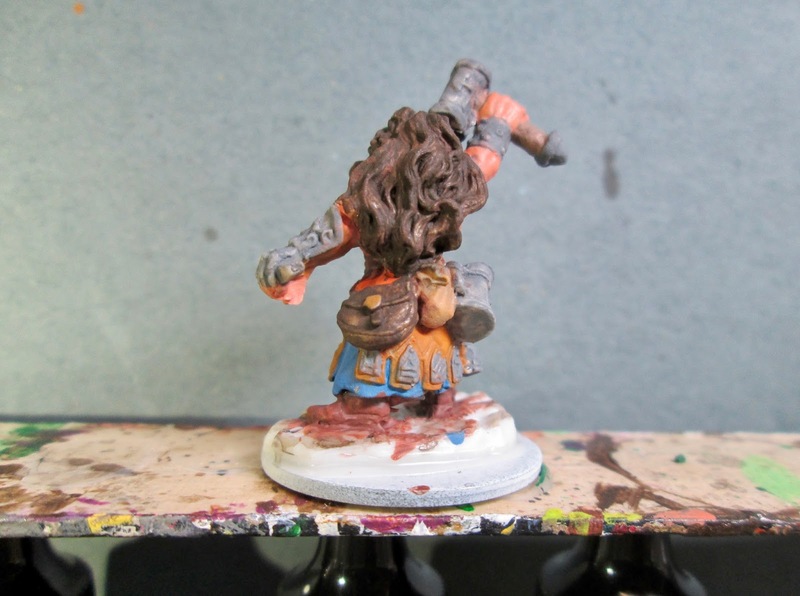 Next, I painted her over-skirt with Ceramcoat “Raw Sienna”, and her apron with Crafter’s Acrylic “Cinnamon Brown”. I then painted her shoes with Folk Art “Dark Brown”, and the handle of her hammer with Americana “Mississippi Mud”. After that, I painted her hair with Americana “Burnt Sienna”. I then painted her large pouch with Americana “Bittersweet Chocolate”, and the little sack tucked in her belt with Ceramcoat “Territorial Beige”. I also used the “Territorial Beige” to paint the rope holding the little cylindrical container on her front, and then used Accent “Mustard Seed” to paint the wraps under her left arm brace, her headband, the belt buckle and the clasp on the pouch. 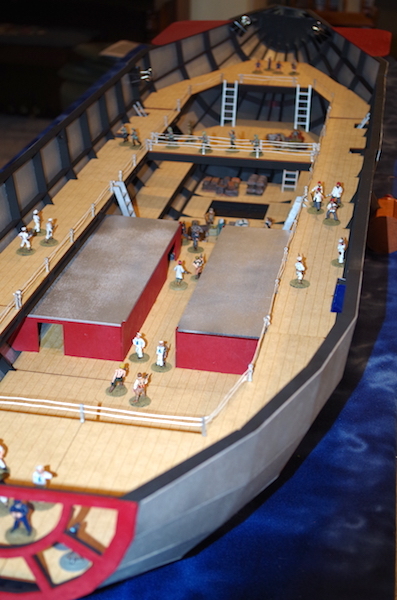 I followed that with painting all the metalwork and weapons with Americana “Zinc”. I then went back over the “Zinc” using Folk Art Metallic “Gunmetal Grey” on the rune plates, arm guard, arm bands, and spike; and Accent “Princely Pewter” on the hammer, stein, and cylindrical container on the rope. I then over painted the “Mustard Seed” on her belt buckle, pouch clasp, and headband decoration, with Ceramcoat “Bronze”. 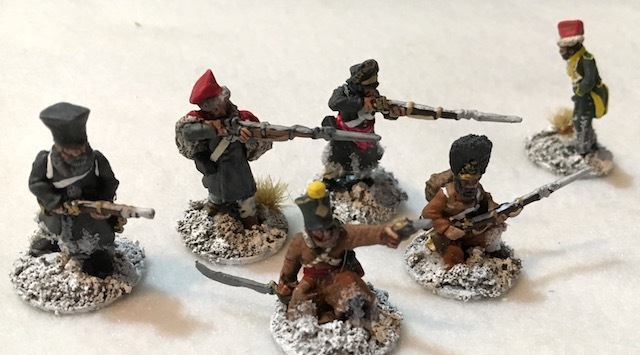 When everything had a while to dry, I went back and gave a wash with Citadel “Agrax Earthshade” wash using a wet brush to all the figure except the metal bits. When that had dried, I went back and gave a wash with Citadel “Nuln Oil” wash using a wet brush to all the metal bits. 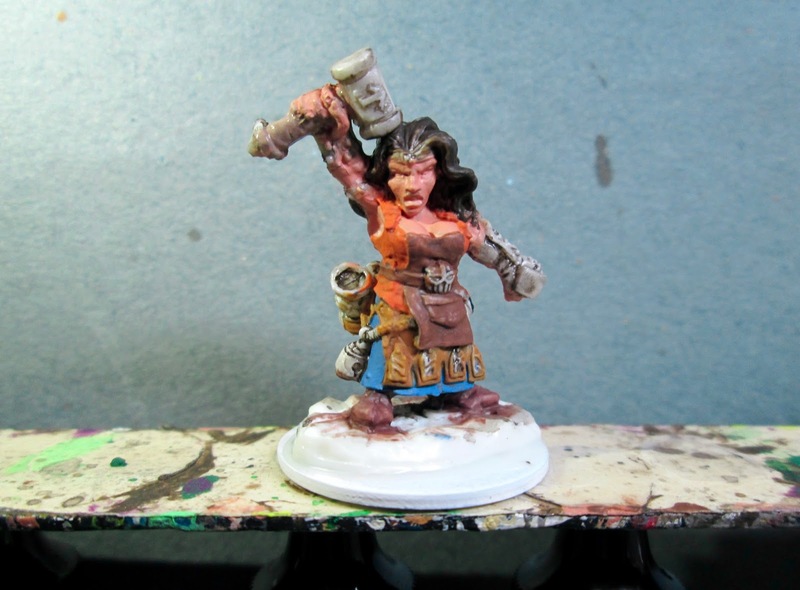 I then painted her eyes, and teeth; and afterwards highlighted her skin using a mix of the original “Dwarf Flesh” and Crafter’s Acrylic “Flesh”. Next, I highlighted her hair using Folk Art “Teddy Bear Brown”, and then a little Americana “Sable Brown”. After that I highlighted her shirt with Crafter’s Acrylic “Pure Pumpkin”, and then did her skirt with Apple Barrel “Apple Scotch Blue”. Then I did the highlights on her overskirt, the wraps under her arm guard, and her head band with Citadel “Bronze Flesh”. I did her apron after that using Ceramcoat “Territorial Beige”, and her pouch after that using the “Mississippi Mud”. Next, I used Americana “Khaki Tan” on the wraps on the hammer handle", and touched a few highlights in her hair with this color as well. Then I used Crafter’s Edition “Taupe” to highlight the sack tucked into her belt, and the rope on which the cylindrical container hangs. I highlighted all the metal parts I had painted with the “Gunmetal Grey” using Ceramcoat “Metallic Silver”, and the parts I had painted with the Princely Pewter using Ceramcoat “Metallic Pewter”. I then highlighted the parts I had painted with the “Bronze” using Ceramcoat “14K Gold”. 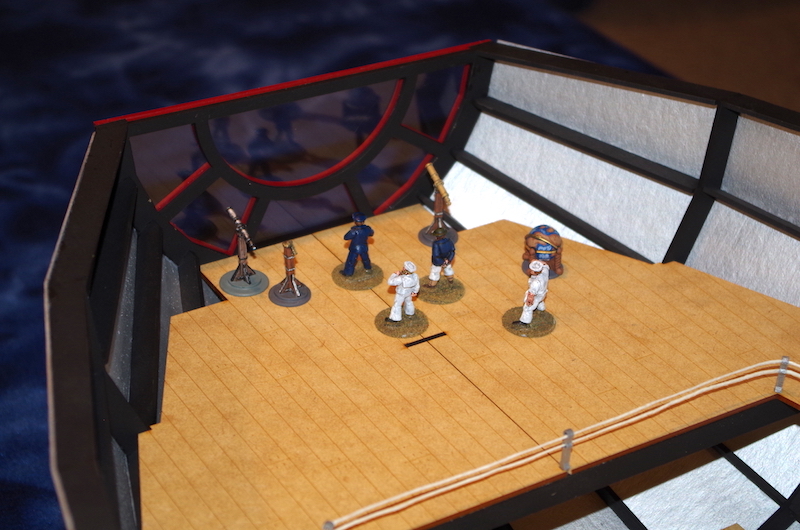 Lastly, I painted the entire base with Black. When the Black was dry, I used some white glue to glue a little sand to the base. When this was dry, I painted the sand Black. 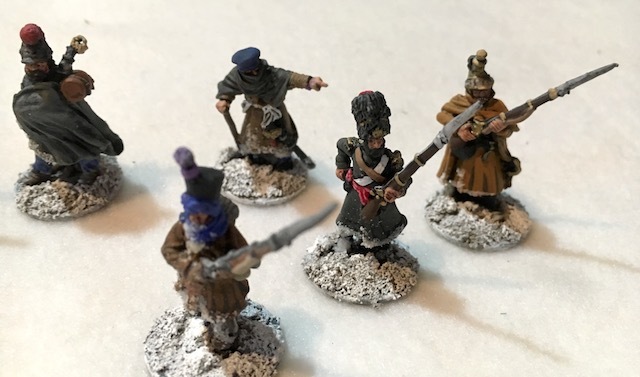 When the Black was dry, I drybrushed the bases with some of the Apple Barrel “Rock Grey”, and then some Americana “Dove Grey”. I’m really happy with how she turned out. 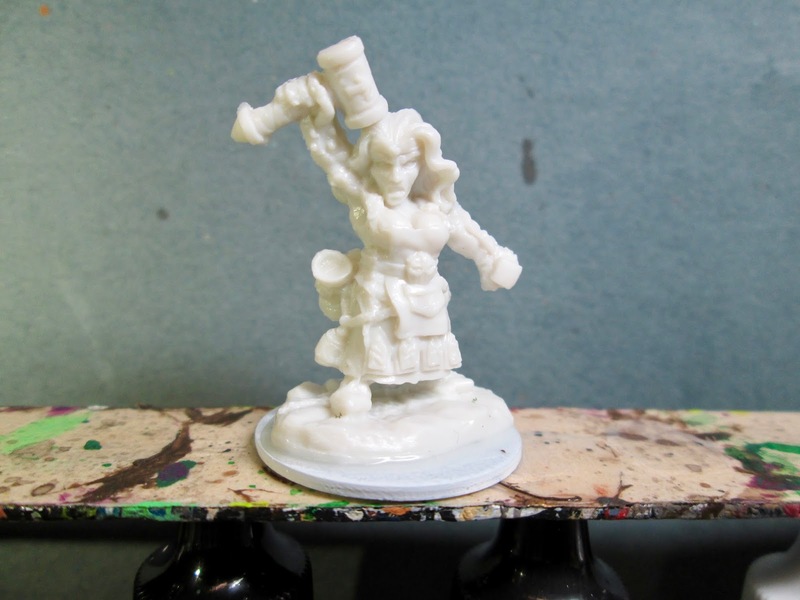 Not particularly dressed for the frozen city, but I think she’ll fit into my Frostgrave Dwarf warband just fine. Tune in on Thursday when I’ll be posting a special article on the conversion work I’ve been doing on my Bones 3, Shipwreck Revenant figure. 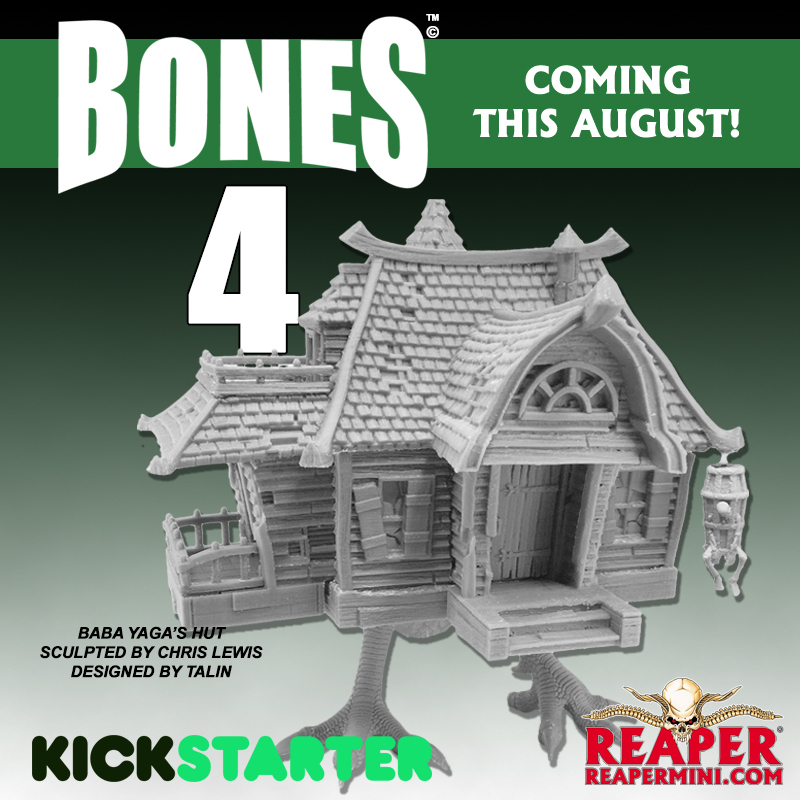 Also, don’t forget, tomorrow, August 1st, the Reaper Bones 4 Kickstarter launches! Be sure to register early, and pledge often! 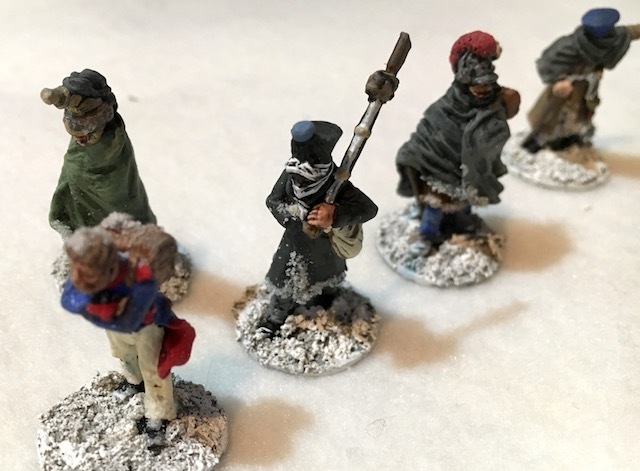 The game begins with the Americans deciding to shift their forces and mass on their left. 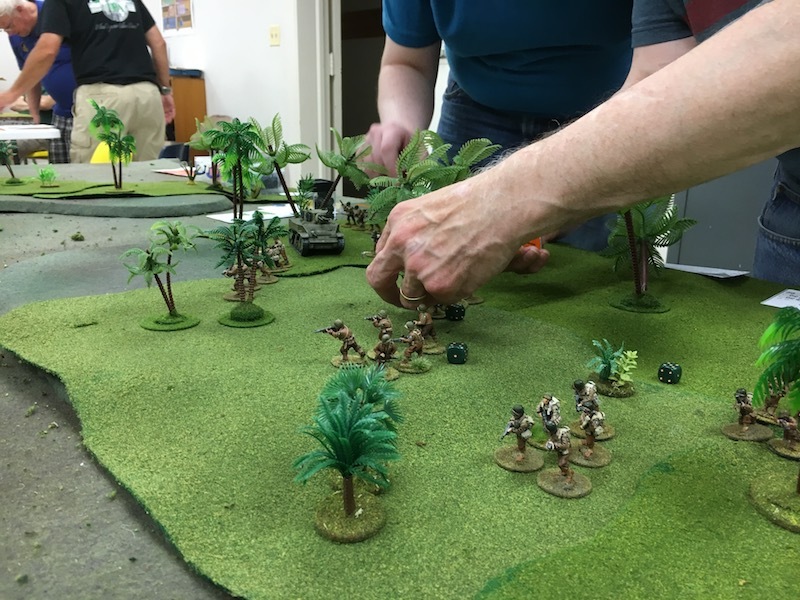 Last night at our club, I ran a Combat Patrol™: WWII South Pacific game using the rules from the soon-to-be-released supplement. 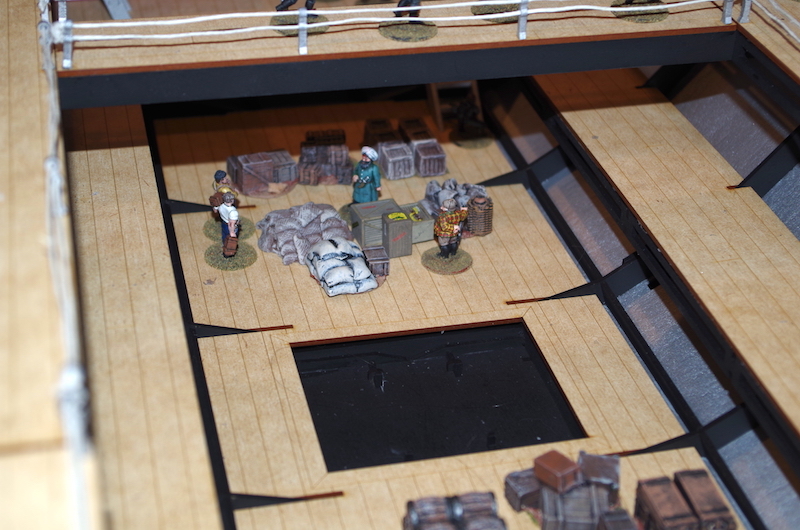 It was a chance for a final play test of some of the rules before the release of the supplement in a couple of weeks. In particular, I wanted to test the vehicle-mounted flamethrower rules. 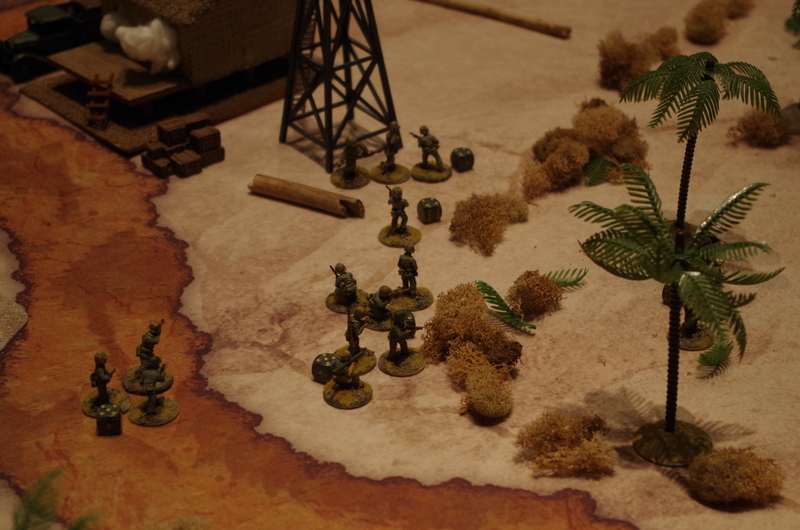 In this scenario, the Japanese held a string of bunkers in a jungle area. A U.S. Army platoon with a man-pack flamethrower and a Stuart flamethrower tank attacked to seize as many of the three bunkers as possible. The Japanese had a slightly under-strength platoon with an attached anti-tank gun and a medium machine-gun. They also occupied three bunkers and two sand-bagged emplacements. Seeing that the Americans were shifting, a team of Japanese advances to outflank the American attack. The Americans wisely decided that they should mass on one flank or the other, rather than attacking on a broad front. This left the Japanese anti-tank gun with few targets during the game. 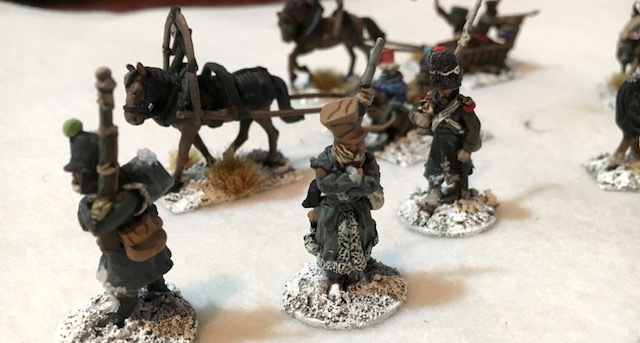 They might have gotten off a shot later in the game as the Americans advanced across the open area, but by then the Stuart had been knocked out. 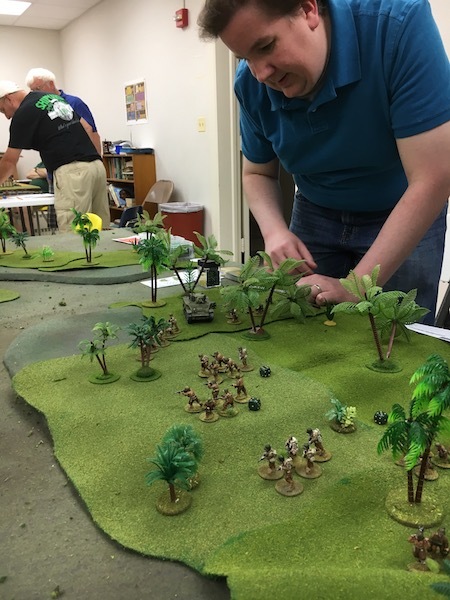 After a bit of a slow movement, the Americans reached the edge of the jungle and prepared to advance across the open ground to the Japanese bunkers. 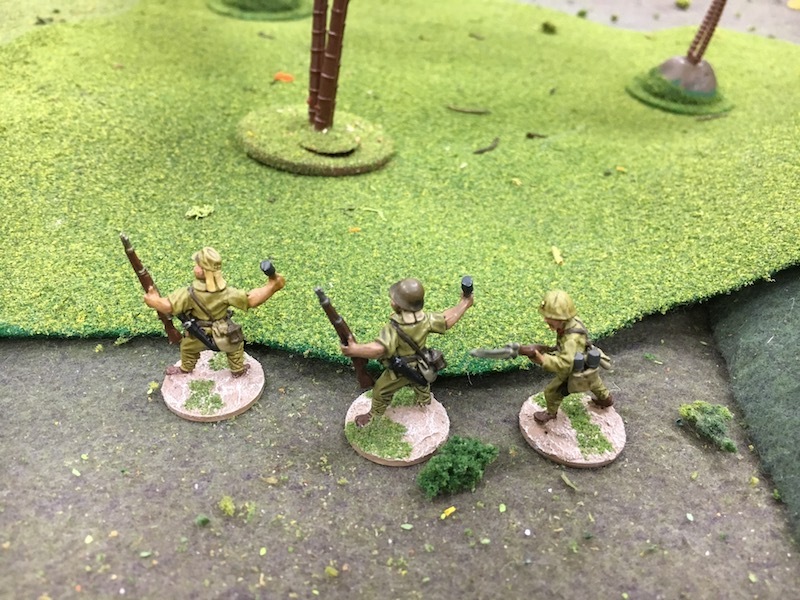 The Americans reached the edge of the jungle and were preparing to dash across an open area toward one of the Japanese positions. 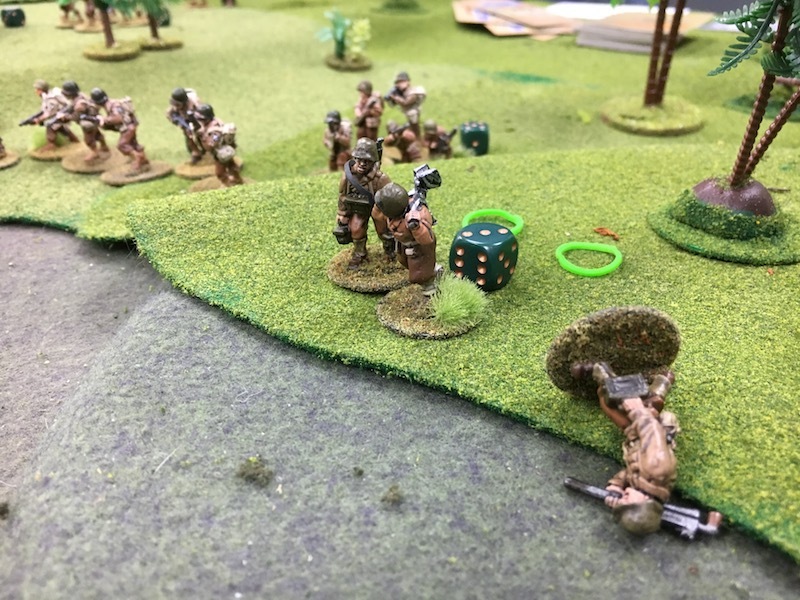 The first unit at the edge of the wood line was an American .30 cal machine-gun team, but before they could get it set up, they began taking effective fire from Japanese infantrymen in their right-most bunker. The American machine-gun team was knocked out by rifle fire from one of the Japanese bunkers. A bunker at the edge of the jungle. I don’t have any log bunkers yet, so I had to use these ETO-looking ones. 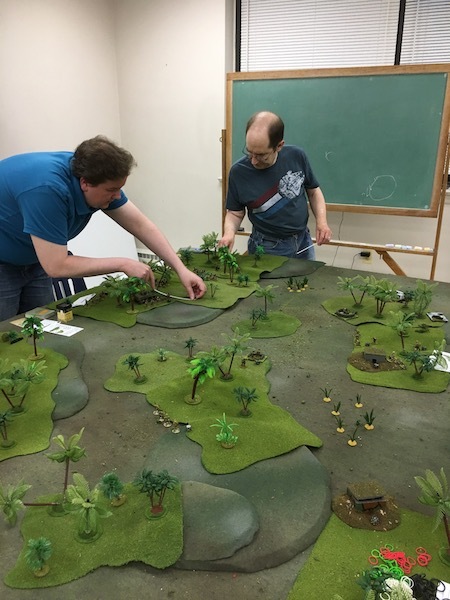 Seeing that they were being flanked, another Japanese team advanced from their original positions into a small jungle area in the middle of the table. A Japanese team advances to interfere with the American attack. 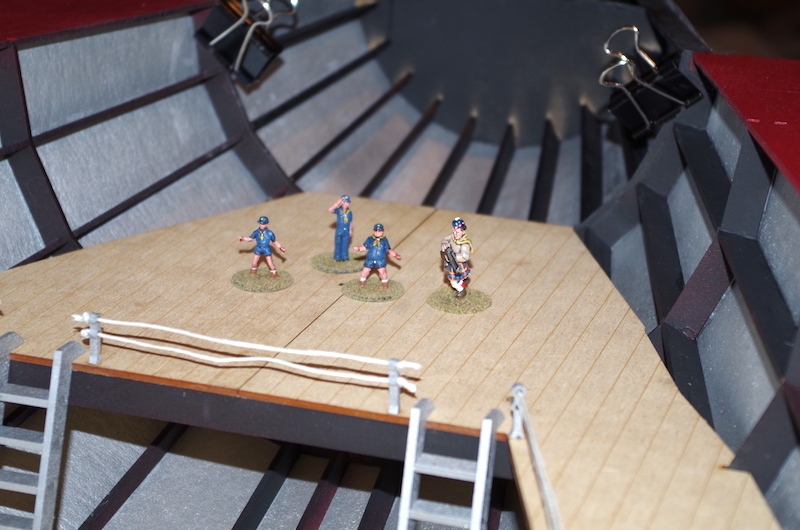 The sandbagged position protects the Japanese medium machine-gun team. At this point the Stuart reached the edge of the wood line and fired on the Japanese machine-gun team in the sandbagged position. This was extreme range for the flamethrower. Two members of the machine-gun crew were killed in this attack. The Japanese infantry team that advanced in the previous picture was equipped with a lunge mine. 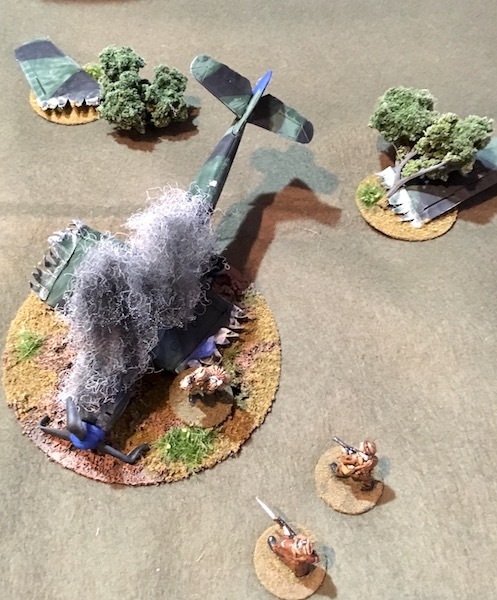 The South Pacific supplement includes a rule for Japanese suicide anti-tank attacks. 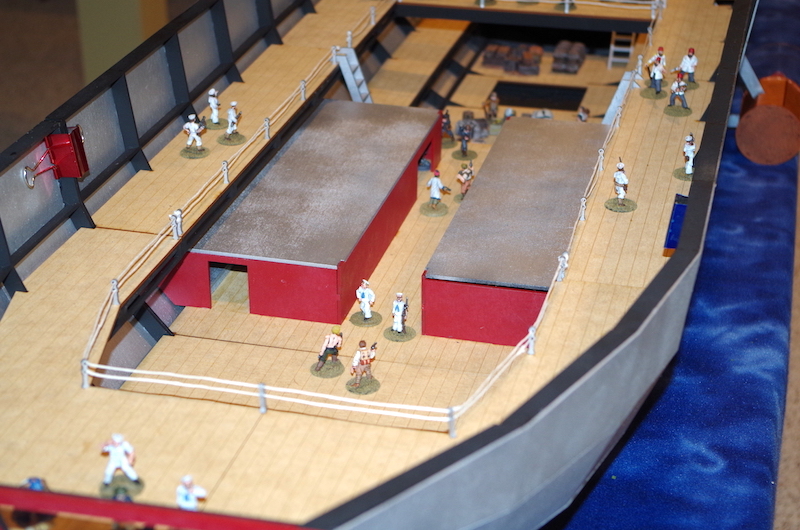 The soldier with the lunge mine and another solider charged out and attacked the Stuart. The attack was successful. The player drew a card to determine where the tank was hit (the side of the hull) and the amount of penetration. Receiving a penetrating hit, the Japanese drew one more card to determine if the vehicle brewed up. It did. So after just one shot, the flame thrower tank was knocked out. Because this was an intentional suicide anti-tank attack, the Japanese figure became incapacitated immediately, but his unit did not accrue a morale marker. The Stuart is knocked out by a lunge-mine suicide attack. 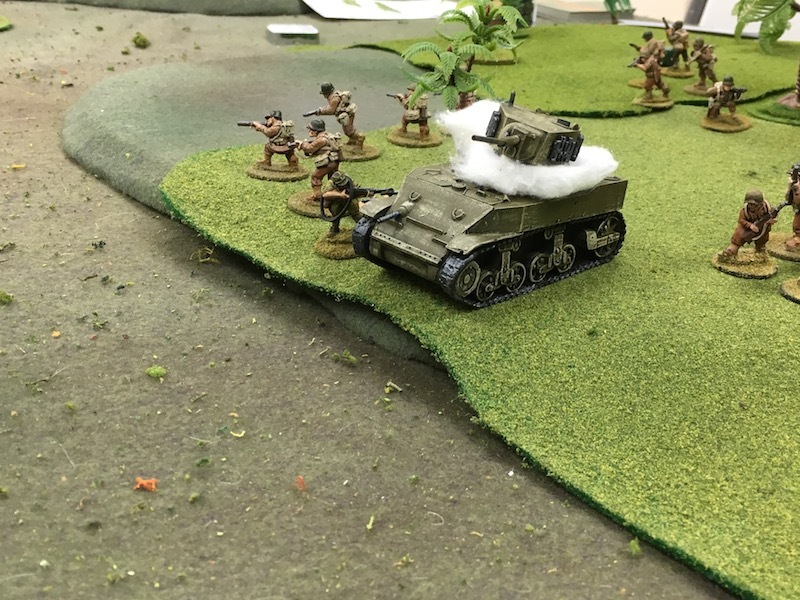 As the flamethrower tank was their most important weapon for reducing the Japanese-held bunkers, things began to look grim for the Americans. Fortunately they still had a man-packed flamethrower and some hand grenades. Teams of American infantry advance. 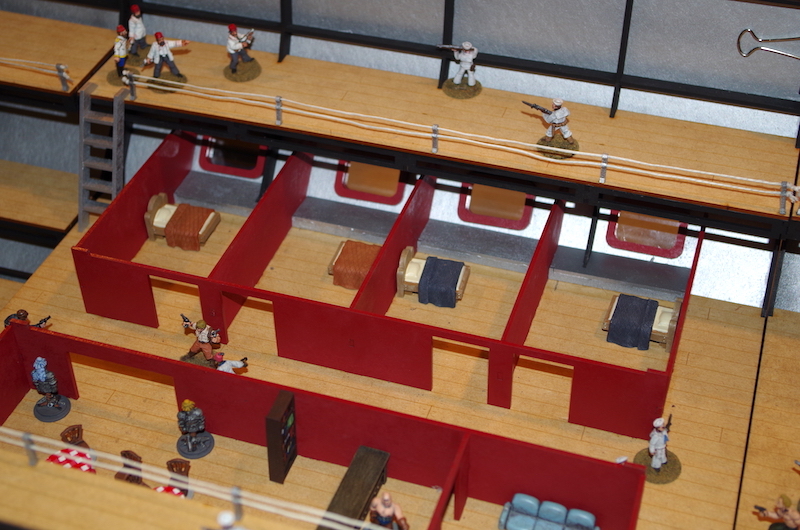 The Japanese in the right-most bunker with the roof removed. This was the focus of the American assault. The center of the table became a fur ball. 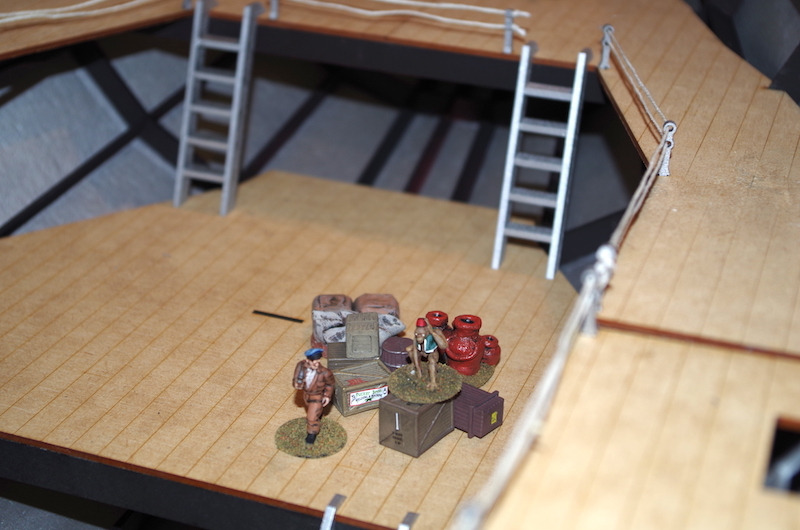 The remaining member of the machine-gun team fired a few shot before running out of ammunition. Although the Stuart was knocked out early, the fact that it suppressed the machine-gun team enabled the Americans to cross the open area with few casualties. 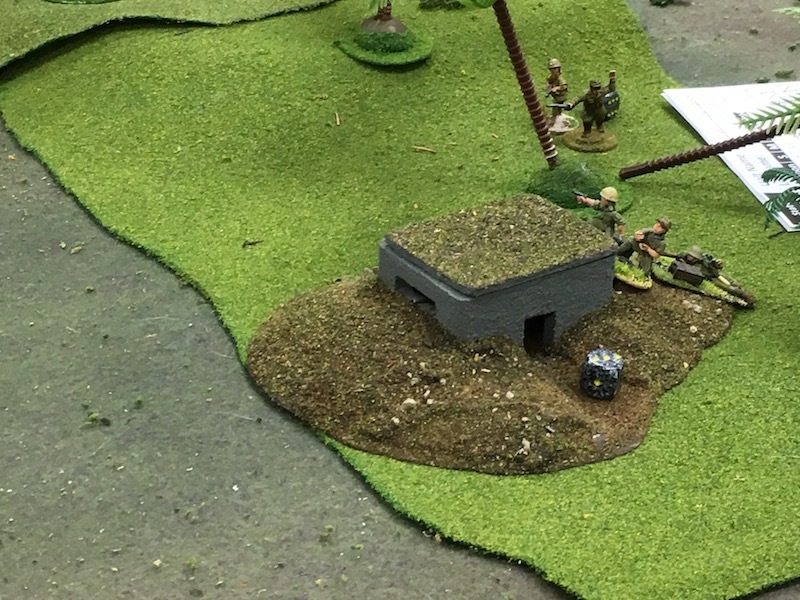 The remaining member of the machine-gun team put up a good fight for a couple of activations, but eventually the Americans incapacitated him and moved past this position to get behind a Japanese bunker. 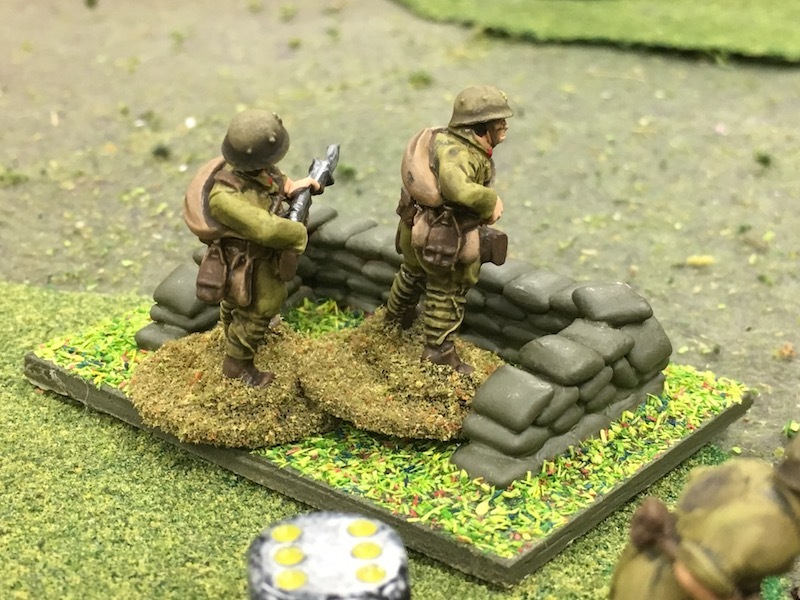 About this time the Japanese realized they were out of position and needed to close with the Americans to slow their advance and keep them away from the bunkers. 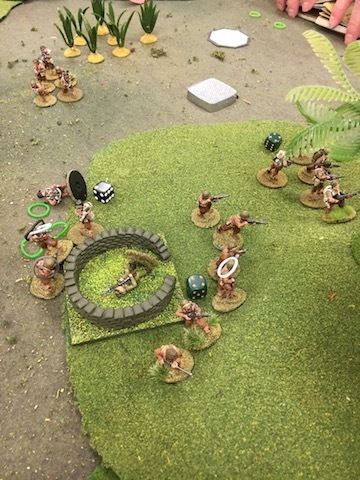 They declared a Banzai charge. 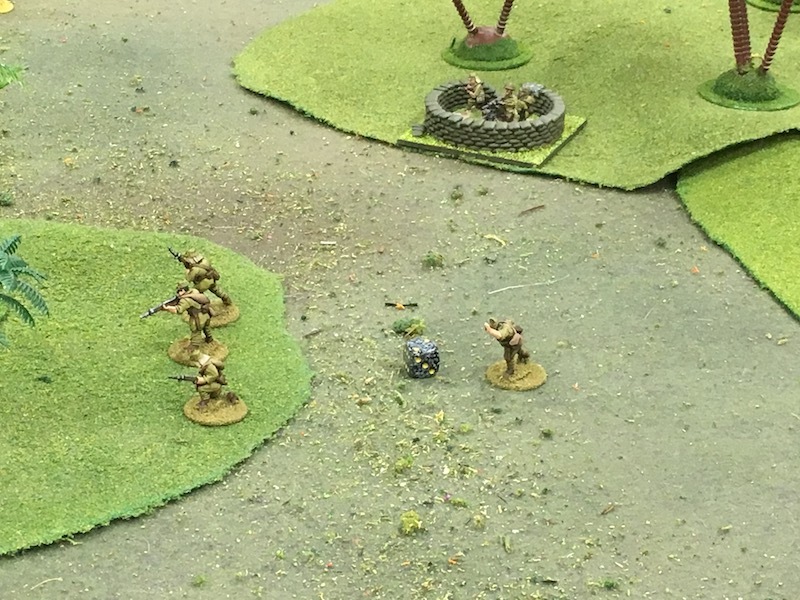 In Combat Patrol™, there is a nice balance in Banzai charges so that they are interesting and effective without being too powerful. Once the charge begins, the Japanese draw two action cards for movement rather than one, giving them much greater speed; however, they do not receive any benefit of cover. The charge continues until a card is drawn from the Activation deck ending it. 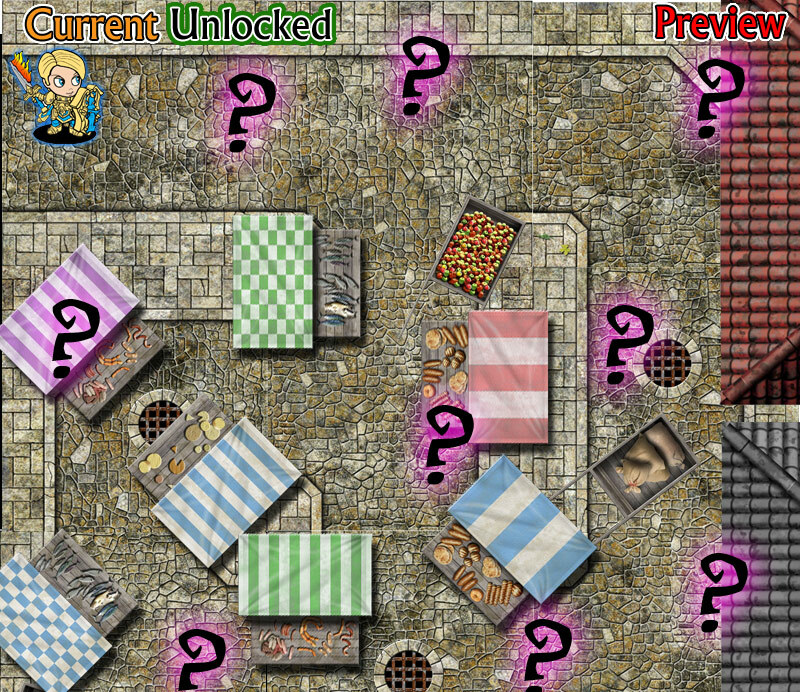 This could occur in the next turn or several turns later. 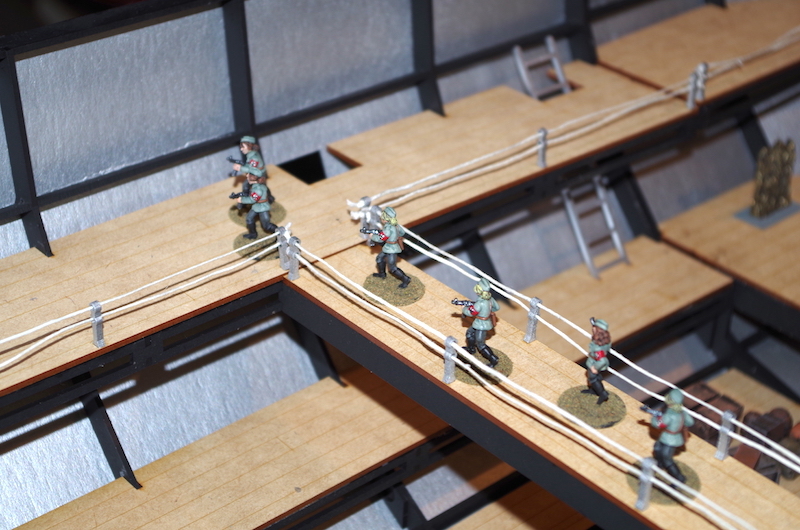 The Japanese accrue morale markers, but they do not resolve them until the Banzai charge ends. In this game, the card ending the charge was drawn as the first card of the next turn, ending the charge earlier than expected. Still, it had the desired effect: the Japanese had closed with the Americans and slowed their advance on the bunkers. 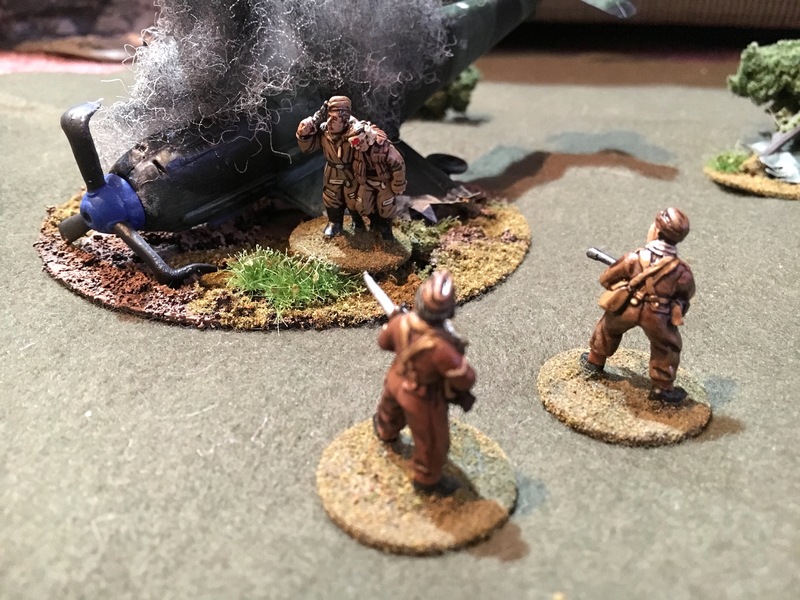 In the meantime, the man-packed flamethrower advanced on the rightmost Japanese bunker, but when his team was taken under small arms fire, the operator was incapacitated. 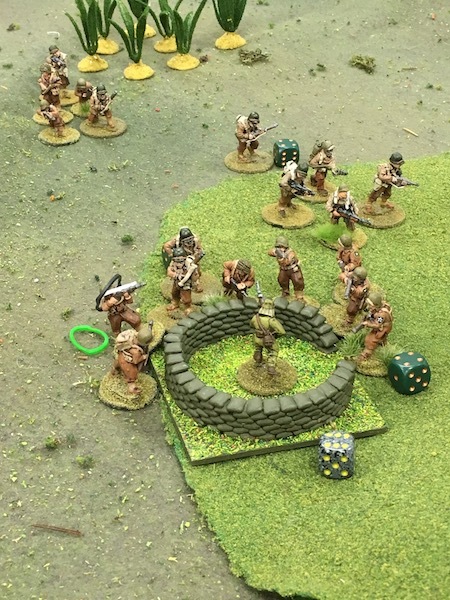 The Americans then made an attempt to drop a grenade into the bunker, but failed. 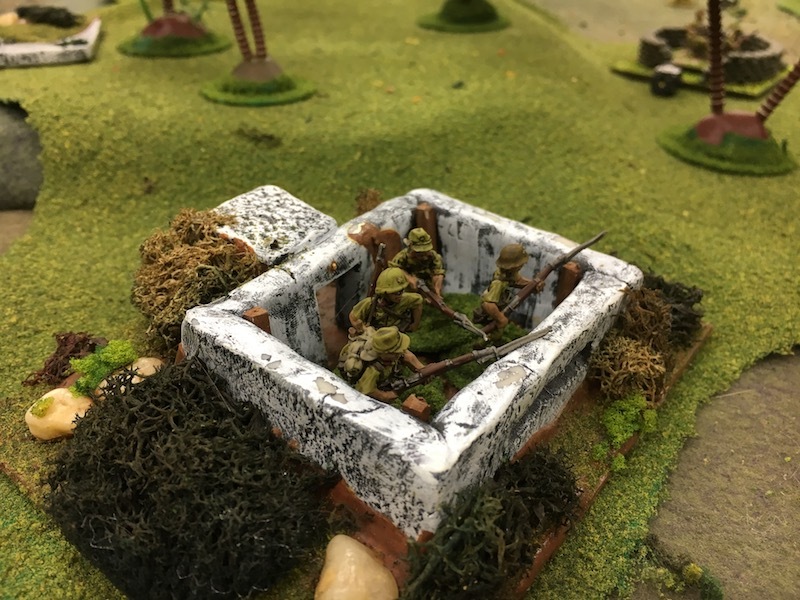 After overrunning the Japanese machine gunner, the Americans swarmed past this position and prepared to get behind two of the enemy bunkers. At this point it was getting late, and the American attack had been spent. I declared the game a Japanese victory. It was a very fun scenario, and all agreed we need to try it again soon. 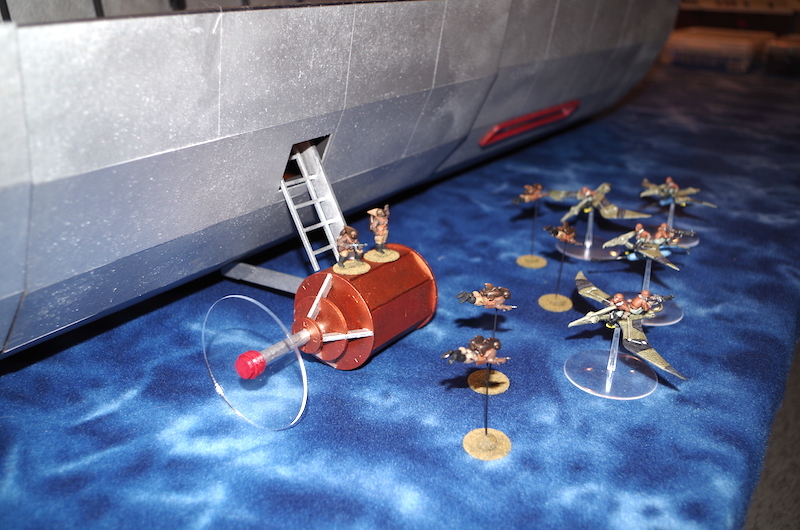 Some months ago I succumbed to the lure of this really cool MDF air ship kit. I have been staring at the stack of MDF, cardboard, and other bits for months. Finally last weekend my daughter and I began to assemble it. 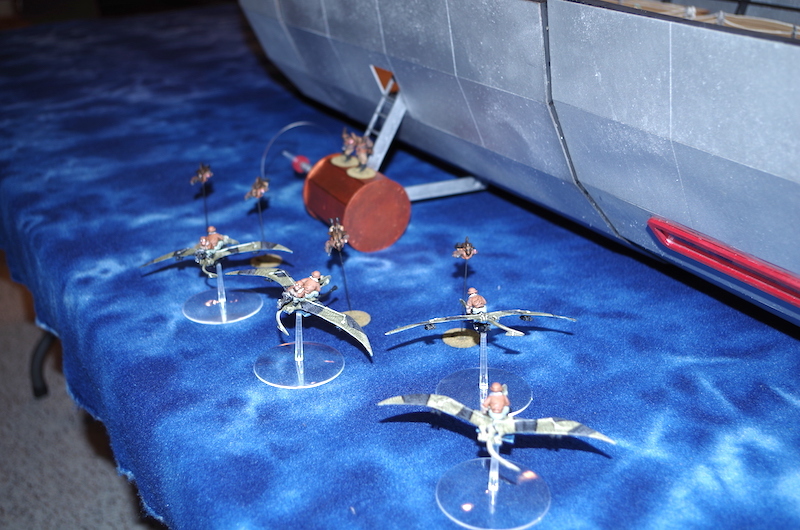 During the week we began to paint the various sub assemblies. 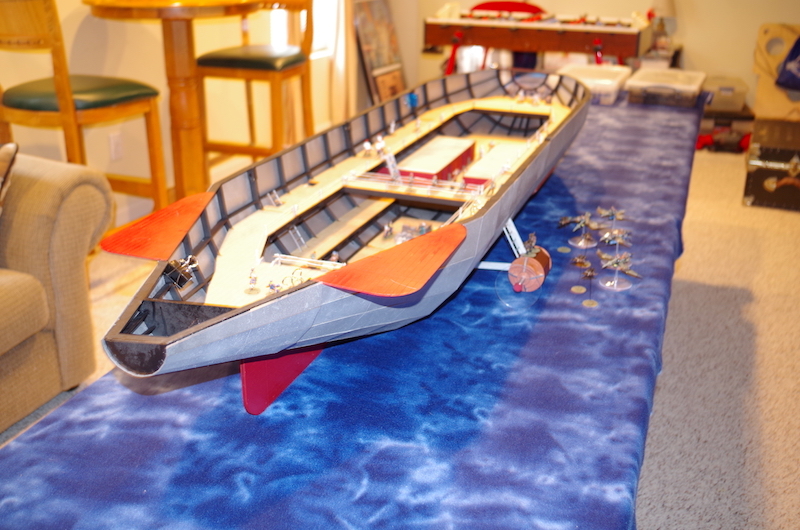 While I was gone for two days on business she completed the final assembly. Storage problems aside, this is a very nice kit and will make for some very fun Pulp and VSF games. 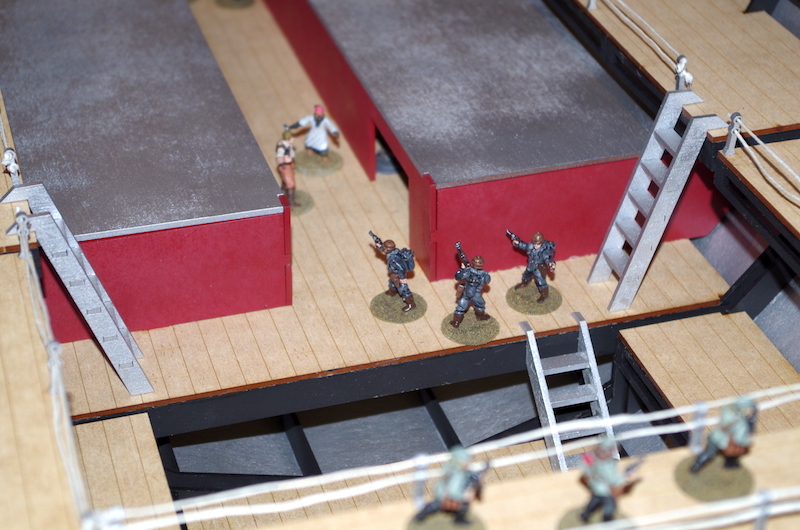 I staged a bunch of my Pulp figures on the air ship to shoot some photos. 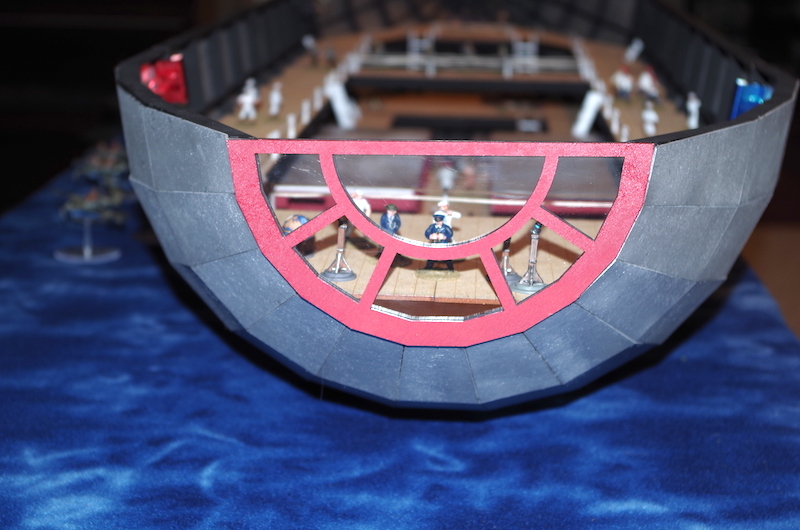 This airship is in five sections: the bow, a passenger section, a cargo section, a stern section, and cone to finish the stern. You can see some alligator clips holding sections together. The kit comes with mount points for magnets. I have to purchase some and glue them to the ship, but for now, I’m using alligator clips. 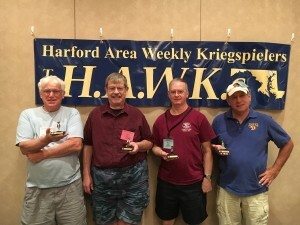 I think this will make a great centerpiece for a series of Pulp or VSF games. My daughter did a terrific job with final assembly. I am anxious to get it into a game soon. 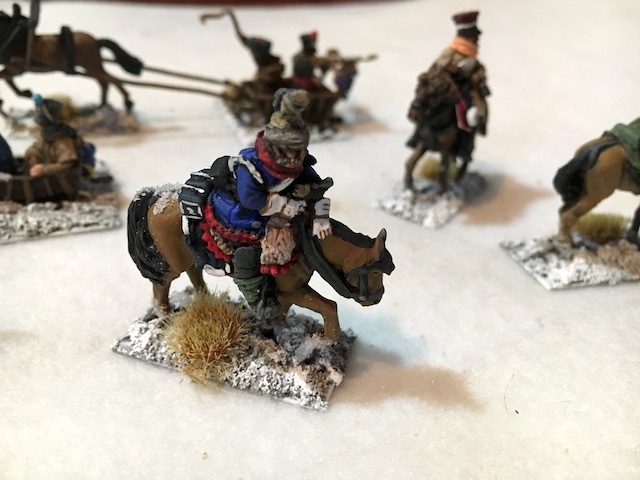 I have been working for over a month to complete a batch of Retreat from Moscow figures. These were a Christmas present two Christmases ago. 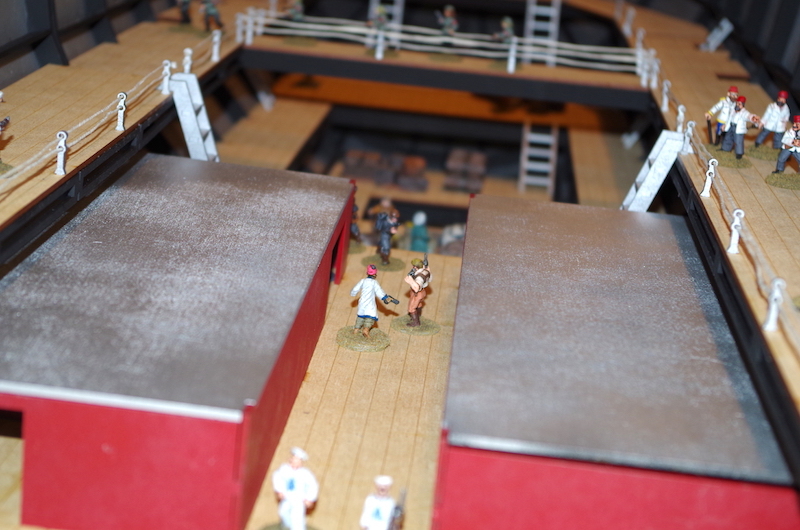 They took a very long time to paint, because each one was different, so I couldn’t really paint them by assembly line. I think they came out nicely. What do you think? 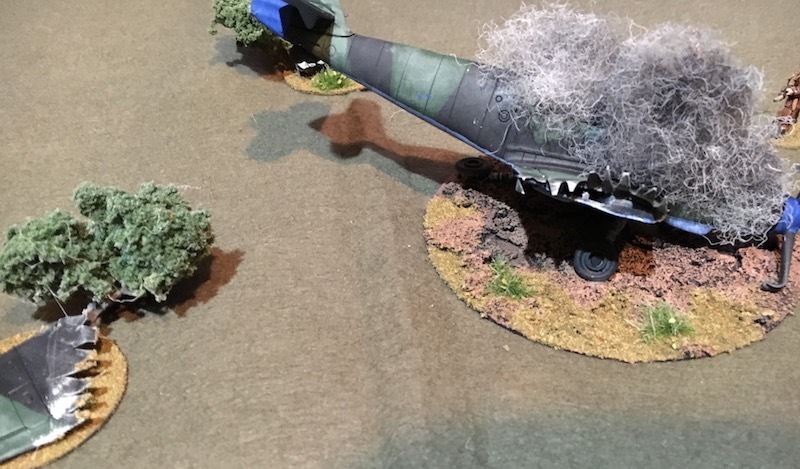 I recently completed building a downed German fighter plane for a WWII skirmish game. The plane was a cheap ($13) snap together kit meant for kids, but it was 1:48 scale. 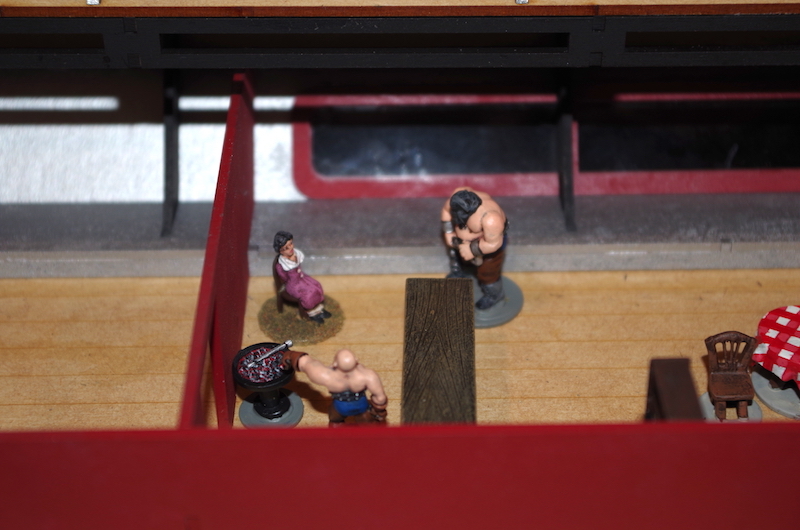 The crew and the Home Guardsmen are Foundry. A view of the wrecked plane, including the wings that have ripped off. Rather than a single, large base, I decided to make the plan on three smaller bases. 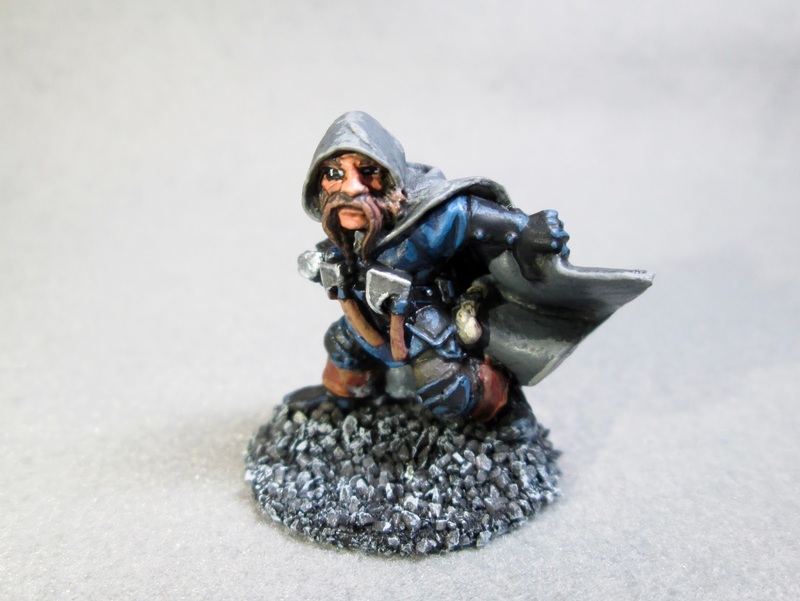 This past week I painted the Klaus Copperthumb, Dwarf Thief, figure from theBones 3 Dwarves set. 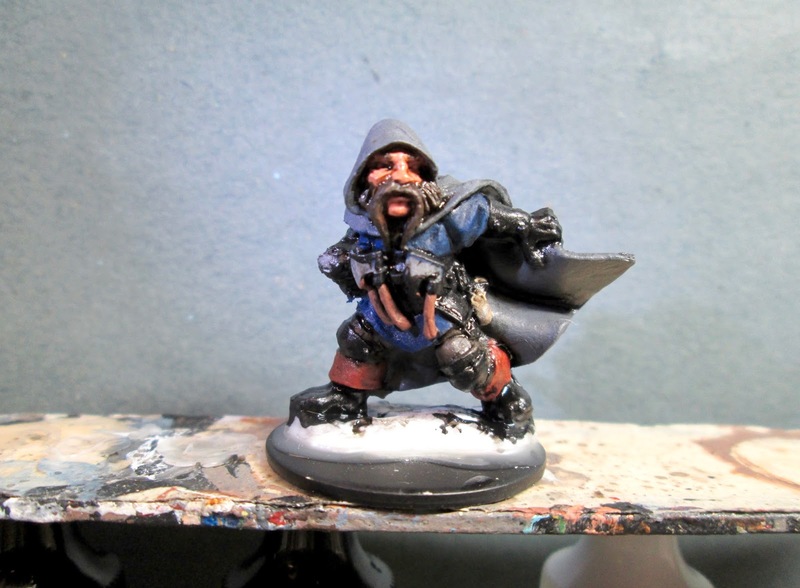 I have a Frostgrave warband of Dwarves that I never quite finished, that began with a couple Dwarf figures from Bones 2 as the Thaumaturge Wizard and Apprentice. 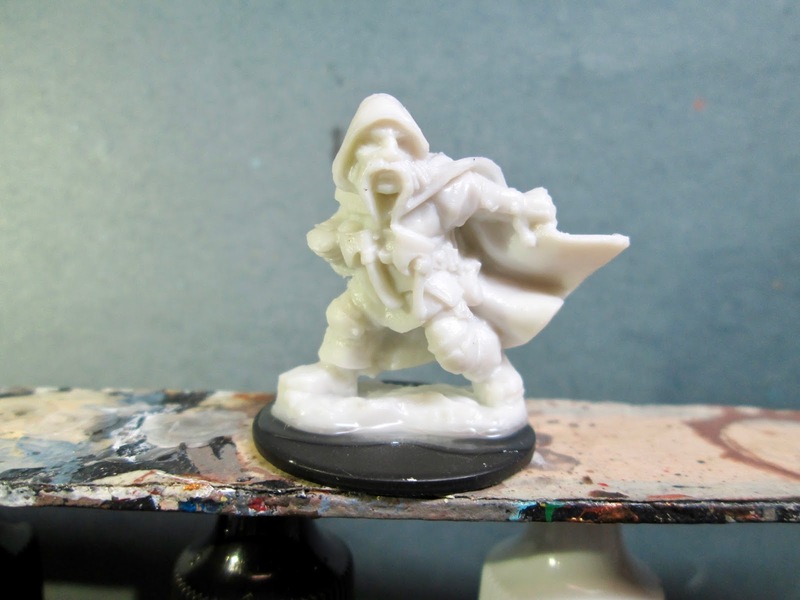 I had been waiting for all the Dwarves in Bones 3 to help fill out the missing soldiers in the group, and selected this figure to start with, to be one of the warband’s Thieves. I began by giving the figure a wash with heavily thinned Reaper “Grey Liner” using a wet brush. 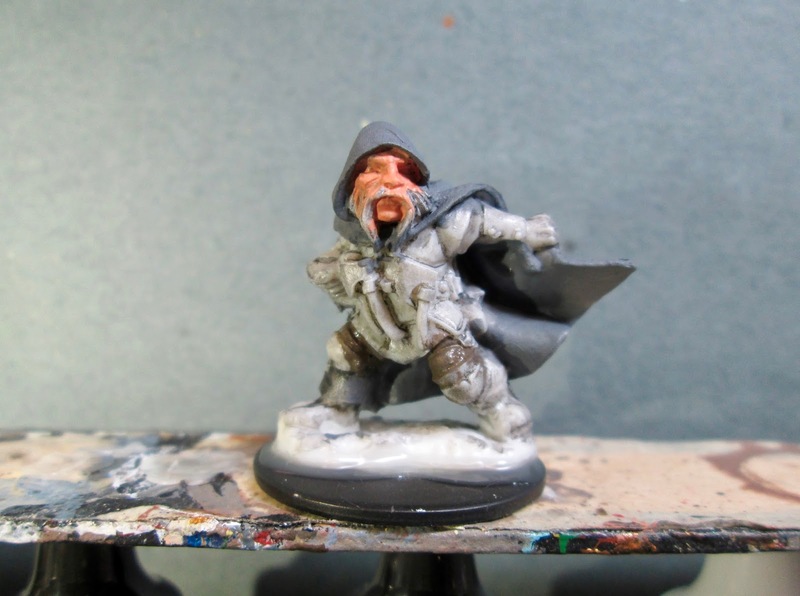 When that was dry, I painted his face with Games Workshop “Dwarf Flesh”. 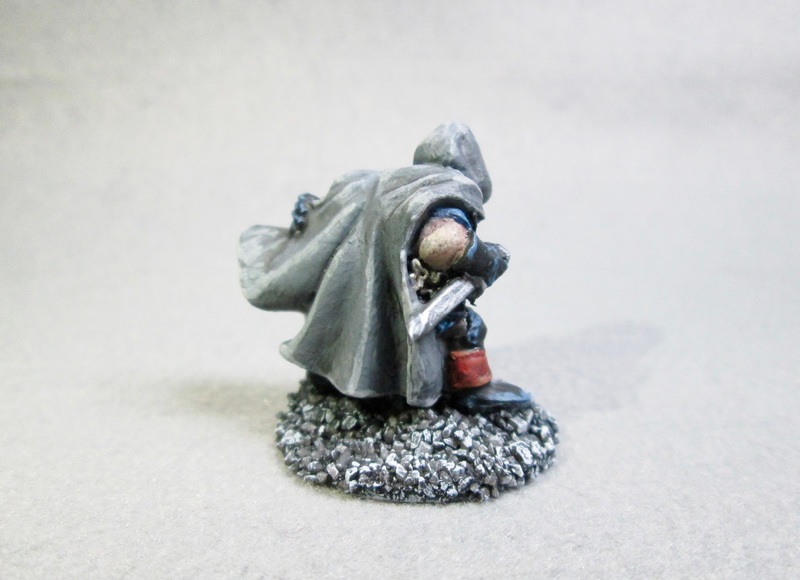 I then painted his cape with Americana “Zinc”, and his pants with Americana “Charcoal Grey”. 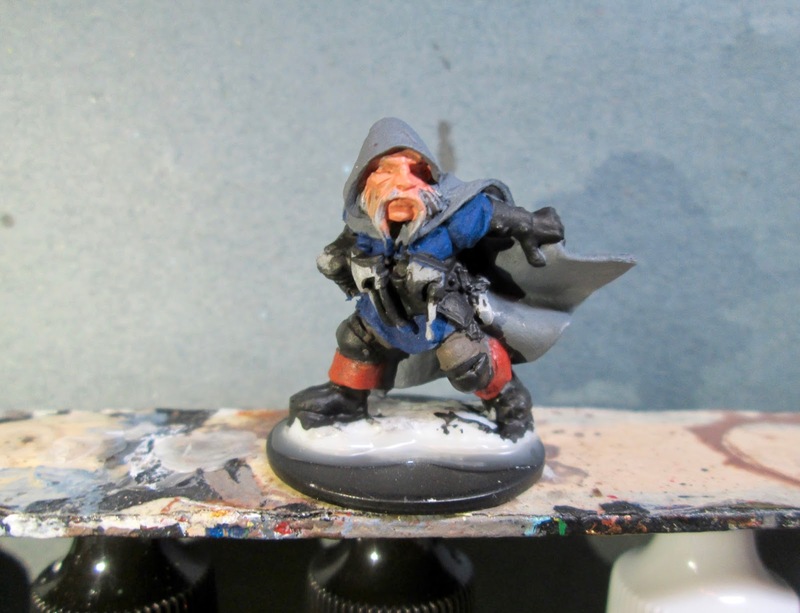 Next, I painted his undershirt with Americana “Mississippi Mud”, and his tunic with Crafter’s Acrylic “Navy Blue”. I then did all his leather equipment and boots with Black and after that, painted the boot tops with Apple Barrel “Burnt Sienna”. After that I painted the hair and mustache with Americana “Bittersweet Chocolate”, and the handles of his axes with Folk Art “Teddy Bear Brown”. Then, there were also some small bags/pouches on his belt that I painted with Americana “Khaki Tan”. I let everything dry for a while, then I gave the figure’s face and hair a wash with some Citadel “Agrax Earthshade” using a wet brush. I let that dry, and then I gave the rest of the figure a wash with some Citadel “Nuln Oil” using a wet brush as well. Lastly, I painted the figure’s integral base with Black. When the Black was dry, I drybrushed the bases with some Apple Barrel “Rock Grey”, and then some Folk Art “Platinum Grey”. I am happy with how this fellow came out. 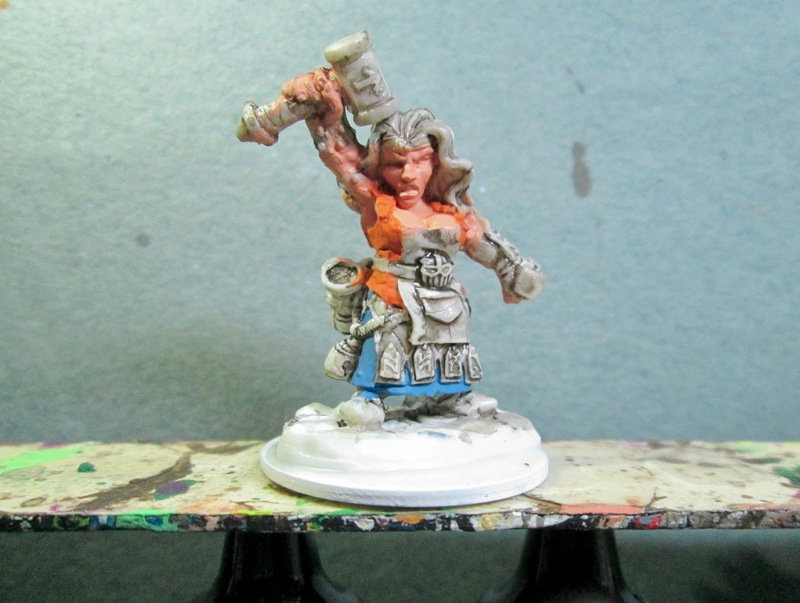 He’ll be a great addition to my Dwarf warband. 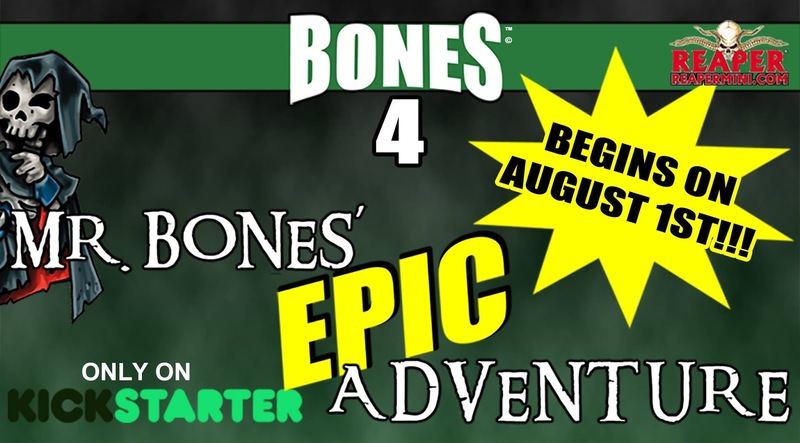 Breaking News: BONES IV Kickstarter Date Announced! 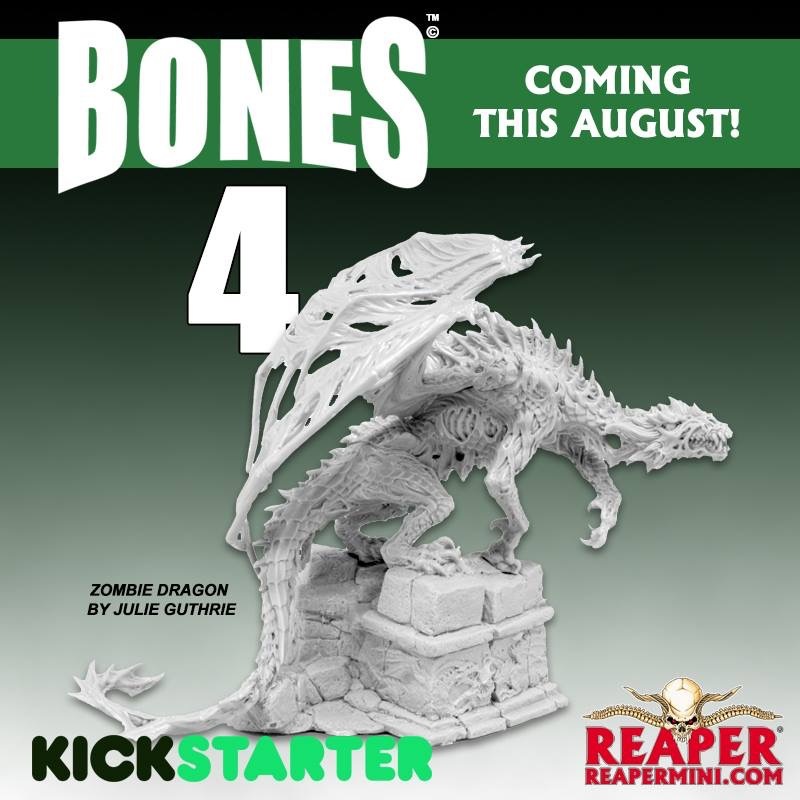 Reaper announced the dates for their upcoming Bones IV Kickstarter this afternoon. The party proceedings will get underway on August 1st. See you all there! 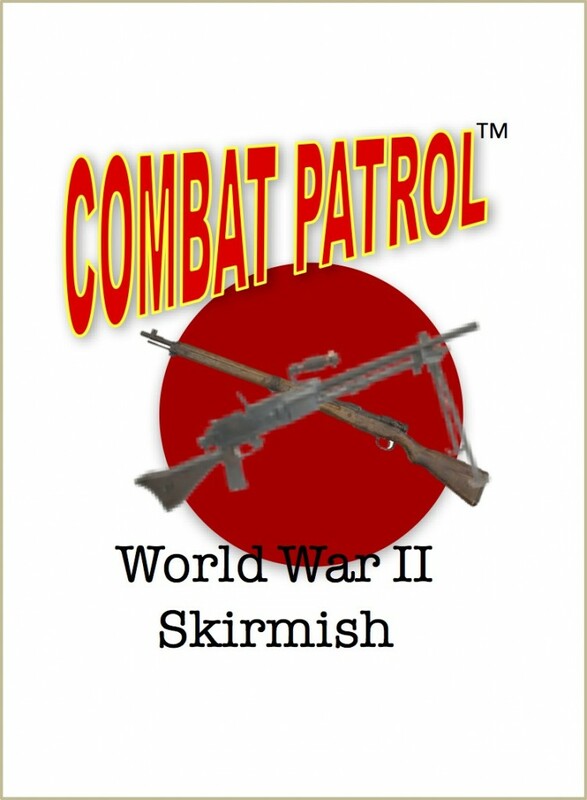 Combat Patrol(TM) South Pacific Supplement is Almost Done! I completed the South Pacific master cards today. These are for the South Pacific supplement to Combat Patrol™. I have sent them to DriveThru to do their magic to make the cards ready to print. At that time, I’ll send the revised masters to Sally 4th to get ready to print them in the UK. Soon afterward players will be able to purchase the cards from either DriveThru or Sally 4th. 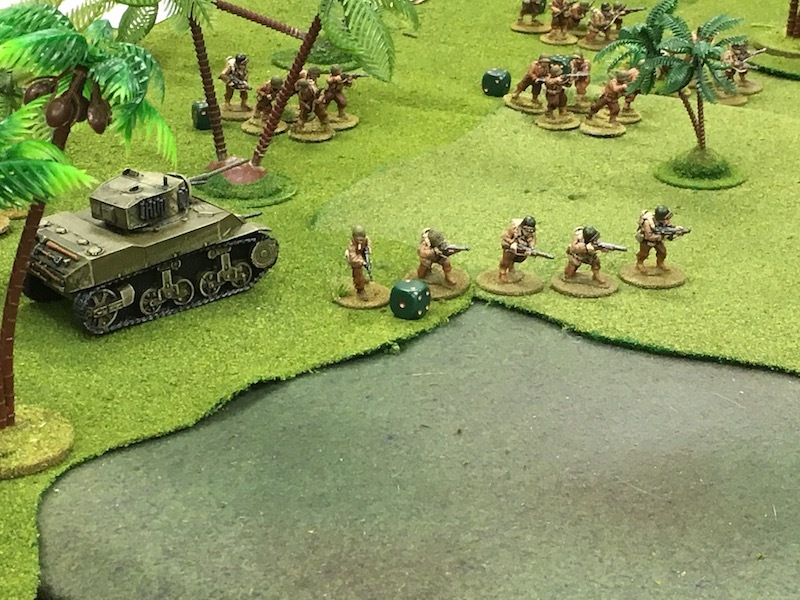 I have one more item to play test in the South Pacific supplement, vehicle-mounted flame throwers, and then it will be ready to go. Why is there another set of cards? The vast majority of the rules are unchanged. 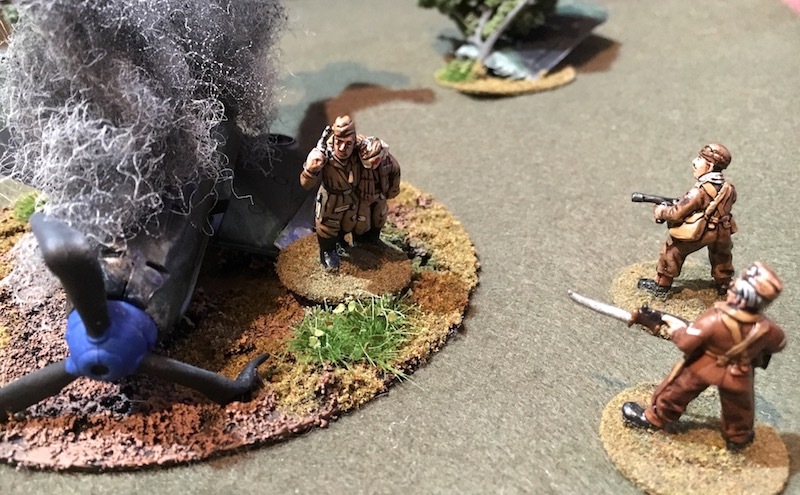 There are a few new items in the free supplement, like Banzai charges, infiltration tactics, incapacitated Japanese lying on armed grenades, and die-in-place missions. This supplement is for the South Pacific, which had a very different tenor than other parts of the Pacific. One thing that came out in play testing is that the normal morale rules don’t seem very “Japanese.” These new decks have more unit-level morale results and fewer individual-level results. 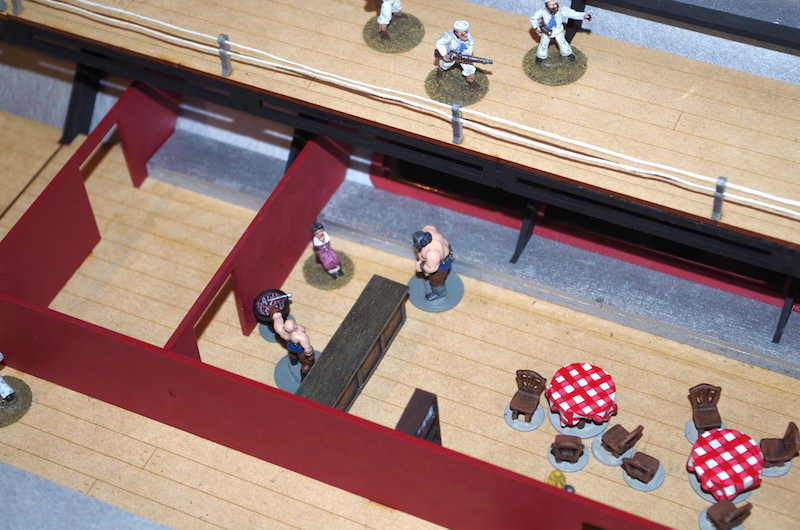 In play tests people felt that the new morale results seemed to represent Japanese behavior better. 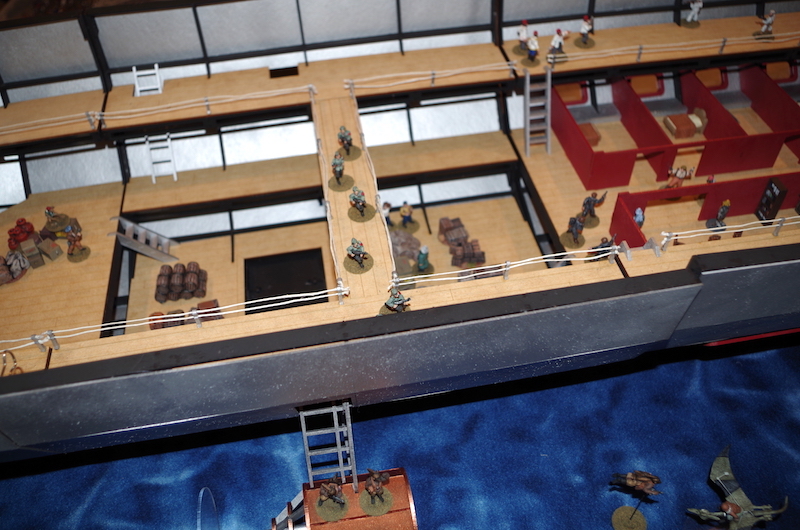 There is a table in the supplement that can be used to cross index the card serial number from the 10 original Action Decks to find the Japanese morale result. I figured that people would get tired of that after a while, so there will be two new Action Decks just for Japanese units. You don’t NEED the new decks, but they will make life better if you play games set in the South Pacific. So the decks are finally done and ready to go to print. That should happen before the end of the month.